Breed Group: Working Weight: 65-90 lbs Height: Male: 25.5-27.5; Female: 23.5-25.5 inches Color(s): solid black or pepper and salt The largest of the three Schnauzer breeds, the Giant Schnauzer originated in Germany. A versatile breed, they were used as cattle dogs, sheepherders, guarding, and as noble companions. Although this breed is relatively rare in the United States, they are steadily gaining in popularity. Character The Giant Schnauzer is powerful and large, yet possesses elegance. This breed is capable of enduring harsh weather and is extremely hardy, independent, and courageous. A proud and determined breed, the Giant Schnauzers varied attributes make them a loyal and trustworthy family pet. Temperament This breed is very loving, protective, and responsible. They thrive on human companionship and do not do well if left alone for extended periods of time. They are not recommended for the novice dog owner, two-career family, or a sedentary owner. This bold breed is intense and complex and requires an owner who completely understands them. They are highly intelligent, imposing, and extremely protective of their family and territory. They make excellent guard dogs. The Giant Schnauzer does best in a home with children over the age of 14 who are considerate and well behaved. They typically do not get along with other household pets. Care The Giant Schnauzer requires weekly brushing and combing to keep the under coat free of mats and tangles. They need to be professionally clipped all-over four times per year. The hair around the eyes and ears must be kept trimmed and their whiskers cleaned after meals. Bathing or dry shampooing should be done when necessary. This breed is prone to cancer, bloat, hip dysplasia, and epilepsy. 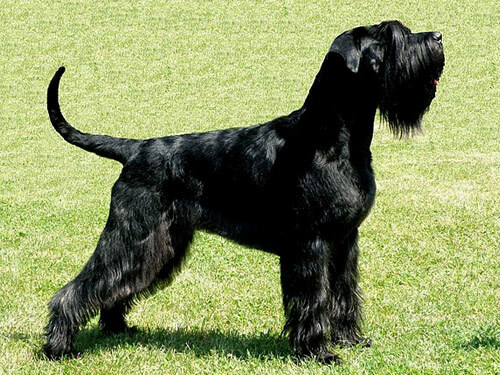 Coat The Giant Schnauzer is a double coat breed. The outer coat is wiry, thick, and harsh. The under coat is dense and soft. The hair is longer over the yes and on the muzzle to form bushy eyebrows and a distinctive beard. The hair on the legs is longer than the body coat. The color of the coat is either salt and pepper or pure black. This breed sheds little to no hair. Early intense socialization and obedience are essential for the Giant Schnauzer. They are a dominant breed and require an experienced and dominant owner who will let them know who the boss is. They are easily housebroken and trained. The Giant Schnauzer responds to respect, consistency, firmness, fairness, positive reinforcement, and reward. They excel in agility, obedience, schutzhound, and are often used as therapy and police dogs. The Giant Schnauzer requires an inordinate amount of vigorous exercise. They thrive on being given something to do and enjoy family play sessions. This breed is not recommended for apartment dwelling. Giant Schnauzers do best with plenty of acreage where they are able to run freely.